As the world knows, India got independence from British rule on 15th August, 1947, though a significant part became detached in the form of Pakistan. However, there were a number of princely states like Kashmir, Hyderabad, Bhopal and Junagarh which tried to remain separate from the independent India - just because of the vested interests of their rulers. In the background of their geographical location and the heartiest wishes, willingness and expectations of the general public, Sardar Patel very soon succeeded to have agreements for merger either by convincing their rulers in congenial atmosphere, or by political & other pressures as everybody knows. But after merger of most other states (and is it not surprising? ), the princely state of Bhopal continued to remain under the total misadministration of the Nawab of Bhopal. It took well over 1-1/2 years before the state merged into Indian union and princely rule ended. On 15th August, 1947, while the entire nation was celebrating the much awaited red letter day of freedom with joy & fervour, the suppressed people of Bhopal state had to control their emotions as even the hoisting of the national tricolour flag was strictly prohibited in the state. Only few young and daring nationalists dared to hoist the national flag at the outskirts of the state without any publicity due to the prevailing terror of the ruler of the state. The ruler of Bhopal state, HH Nawab Hamidullah Khan (who had been titled ‘Aala Hazrat’ also) was such a pro-British polished diplomat who had his personal influence not only over the heads of the remaining states (he even remained the Chancellor of ‘The Chamber of Princes’ for two times, in spite of being ruler of a small state otherwise), but over the eminent national leaders of the independent India also. That’s why he continued to maintain the Bhopal state as a separate individual entity by not merging in the union of the independent India. It’s as if making another small country, like Pakistan. The steel man Sardar Patel too remained helpless due to the diplomacy and misleading informations and assurances from the ruler of the state. Not only that, the nawab could influence & suppress those senior leaders too who had been leading various public movements against him for peoples genuine rights. He succeeded in demoralizing them. (this secret agreement was ultimately disclosed by the news paper “Nai Raah” before public). During all such odd & unfavorable circumstances, a group of nationalists young people of Bhopal took the hard task of not to allow the Bhopal State be another detached fragment of the country, like Pakistan. They chose the power of pen and print to communicate the truth before people of the state, to face the atrocities of the misadministration, and to fulfill their pledge. (…if one has to face a gun, to release a paper or journal has more impact than trying to face it through bows-arrows or swords… i.e., journalism is more powerful than arms & ammunition). 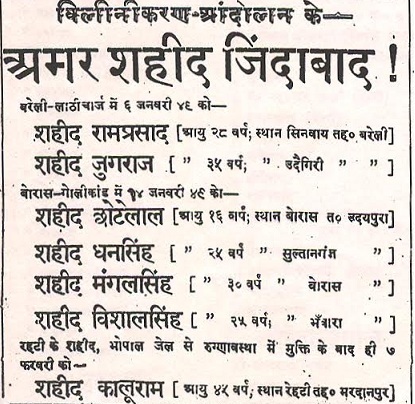 In this way, “Nai Raah” , a weekly Hindi journal (later followed by its Urdu version too) was started with the motive to raise the voice of people of Bhopal State, to move for merger. “Nai Raah” which very soon became the most popular journal of the state with status of the mouthpiece of people of Bhopal State, conveyed and propagated the smoldering fire in the hearts of downtrodden and suffering public of the state to each & every nook & corner in a such a way that the entire state ablaze to react actively in a non-violent and planned way against the misadministration so as to lead to the merger of the state in independent India. The martyrs of Bareily and Boras had to soak the tricolour by their own blood to keep the pride of the national flag high. The example of martyrs of Boras is rare in the history of freedom struggle. As the ruler of the state tried their level best by hook or crook to suppress and crush the merger movement, the people of the state determined for the merger to a greater and greater extent. Then as the truth prevails, in spite of all diplomatic tricks, misleading publicity and influence the ruler, ultimately Sardar Patel had to intervene on behalf of the union government to pressurize for the much awaited merger. As a result, the agreement of the merger of the Bhopal State in the union of the independent India was signed on 30th April 1949 to be effected from 1st June 1949. The Bhopal State which thus joined to the mainstream of our developing independent nation on 1st June 1949, subsequently became capital of this large state of Madhya Pradesh and assumed the shape which we’re seeing today. But should one forget that the people of Bhopal had to fought a dual struggle (against the British, and later against the nawabi ruling of the state) which our generation is enjoying without even knowing about the history of its freedom struggles. The merger movement of the Bhopal State is unique in the history of Bhopal State, since its establishment till date in many respects. The entire movement was planned, led, conducted & executed by youth of Bhopal who disposed off this political task too successfully as their duty towards their motherland by sacrificing all that had, and not taking politics as their subsequent career, profession or hobby. That’s why after the successful execution of the task of merger, most of them resumed to their own professions without deriving or expecting any advantages from the government. The important leading role of journalism in the form of a paper (“Nai Raah”) in such a movement of general people is also rare. The arrests were made in such a large number that after the permanent & the temporary jails were overstuffed, the arrests had to be transported to the nearby forests. The state witnessed general strike for a month. After the gents’re arrested, the movement was continued live, active and led by the ladies of eminent families. Even after the ban, prohibition and seizure of the paper “Nai Raah”, its publication & distribution continued from the places out of the state by the underground workers. The history of Merger of Bhopal State is not only sensational & interesting, it’s aspiring too for the young generation particularly the young journalists. The need of the hour is only to disclose the actual facts from the history.